I am a bit belated on this post. I’ve been cleaning my apartment in plans for a visitor coming to stay and it’s been taking up a lot of my time. 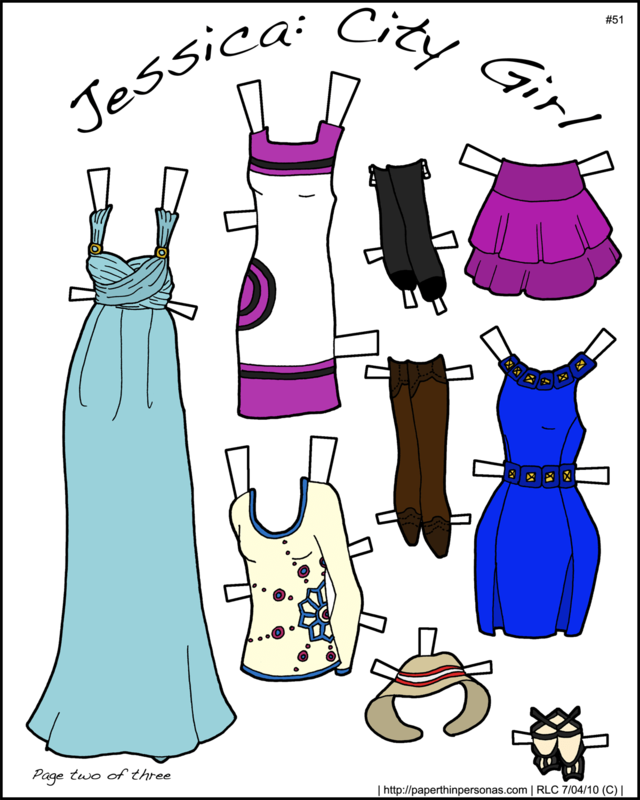 Today’s paper doll is the last of the Jessica things, so there will be a new short run paper doll starting next Sunday, unless I get too busy to post it which might happen. Life is full of surprises. 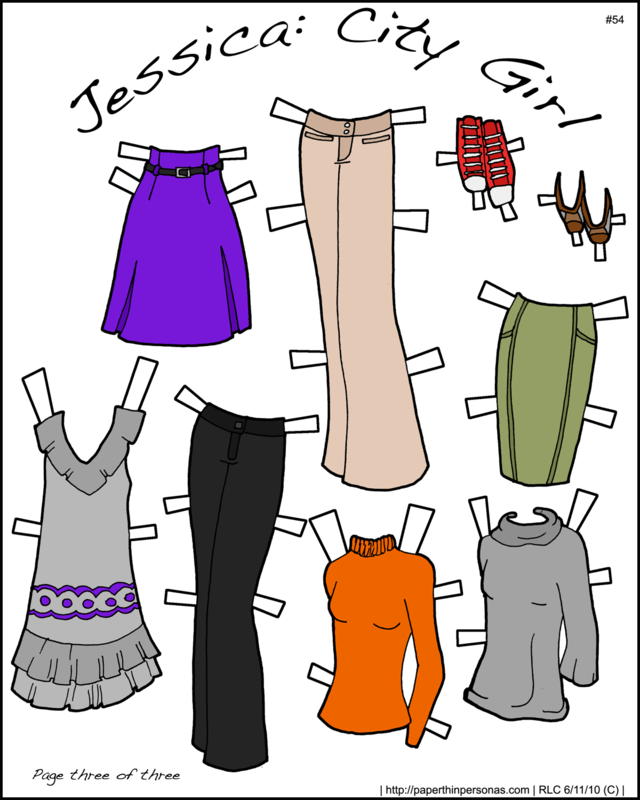 My favorite thing about this set of paper doll clothes is the orange sweater. It’s SO orange, but I also love the brightness of the color. Plus my Vogue magazine tells me Orange is the color of the season. And would Vogue lie to me? Of course not. I’m not totally pleased with how the gray dress turned out. I think the trim looks a little flat and should be more curved and I have mixed feelings about her shoes, but I’m trying to stay positive about the paper doll since in general I like it. As sometimes happens, I can’t think of anything to really say about this paper doll. It’s the second page of the Jessica set and there will be one more. I’m fond of the teal dress, because I still like the bodice. Many of the pieces came directly from fashion magazines- the blue dress is one case- but some don’t and I think over all that weakens the paper doll. I wish I’d done either everything high fashion or kept it all more casual. Today’s paper doll is named after a friend in middle school who always said she was going to leave Juneau and head off into the city down south (when you’re in Alaska, the habit is to call anything outside of the state “South”. It’s a matter of perspective I suppose). Eventually, I think she ended up at college in New York, so I suppose it worked out for her, though I lost track of her since then. It’s funny how people we’re close with at one point in our lives drift away from us later. I hadn’t thought about Jessica until I was trying to name this paper doll and then for some reason she came back to me. Odd how the mind works. Coloring the paper dolls is always a bit of a crap shoot. How they show up after converting them into PNG’s is always a bit of a shock. Colors are always more muted. Sometimes I like it, but it can play havoc on skin tone. I think I managed okay with Jessica’s coloring, but I wish the brightness of the coat had converted better. Oh well, I suppose I’ll just have to keep messing with formats. She’s also the first paper doll to be posted in a vertical print format, not a landscape print format. Just something to remember when you’re printing out the PDF.